Windows 8 will be the latest Windows OS (operating system) when it is released, probably in September or October. For now we have the Consumer Preview to play with. The Windows 8 Consumer Preview seem like a release candidate to me. It is very polished, very fast and not buggy at all. Windows 8 is an OS for desktops and laptops of course but it is also going to be used on tablets similar to the iPad. I do not have a Windows tablet to try it out on so this review is just about using it on a standard computer. Windows 8 is very fast and will run on very slow hardware because it’s developed to run on very slow ARM processors (processors used in phones and tablets). Windows 8 is mostly like Windows 7 except for a few changes. The first and most obvious is the new user interface (UI). When you login to Win8 for the first time what you will notice immediately is a dark blue background with a lot of rectangle and square icons called tiles. These tiles represent your applications. Don’t panic! This is the new start menu, not the desktop. Click the “Desktop Tile” and you will see the good old Windows desktop environment. To return to the start menu press the Windows Key. It’s just getting going and the Windows 8 App Store only has an additional 66 apps in it. Soon I’m sure we will there will be apps from all of the big players, Google, Twitter, Facebook, Gowalla and many more. Windows 8 has made a huge commitment to cloud computing. You have the option to login using your Live ID then you can seamlessly switch from Live apps to desktop apps. Most notable of these is Skydrive which was pretty much useless until now unless you use MS Office 10. For few years there has been what is called the “Ribbon” at the top of MS Office. It replaces the old menu bar. Now they’ve brought the “Ribbon” to Windows Exploer. 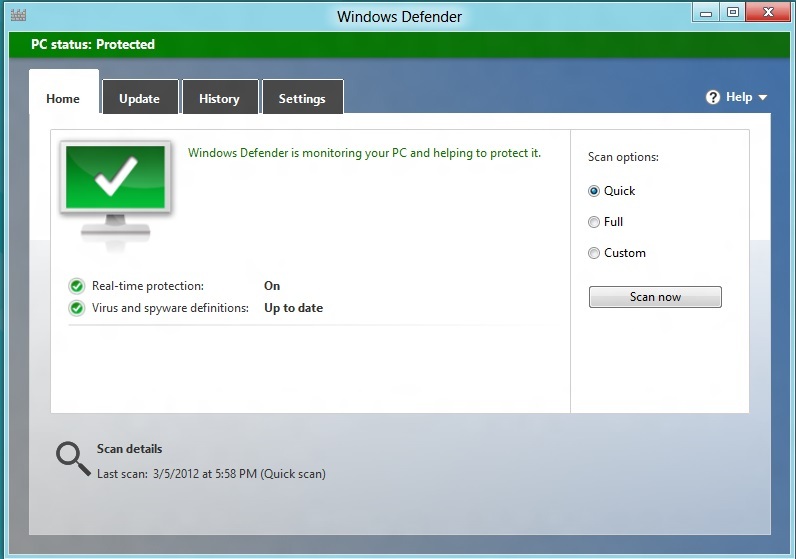 You may remember the name Defender or Windows Defender. It was an anti-spyware program that Microsoft purchased. Now it is what they are calling Microsoft Security Essentials a really good anti-malware program that I’ve been using for years. Defender will come with Windows 8 so there is no need to buy and anti-virus. The general rule is use the OS that comes on your computer and do not upgrade. That said if you have a computer that came with Windows 7 and you really want to upgrade Windows 8 will run fine on it, maybe better than 7. For a lot more information on Windows 8 see Windows Weekly 250. Read what I learned about Windows 8 On Slow Computers.